love for Sailor Moon today! -Coming Soon: Weekly Artist and Writers showcase/promos. The best place for Sailor Moon! We cover general discussions, debates, theories, art work, AMVS, fan fiction, Sailor Moon News and so much more! We run giveaways, contests, and are now offering role playing! We are a great hang out for fans of Sailor Moon of ALL ages! 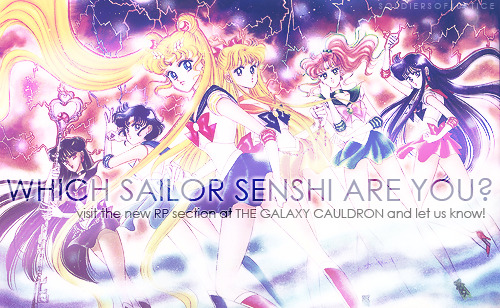 GC RP Forum wrote: The Galaxy Cauldron RPG is a basic RPG based upon the series of Sailor Moon. Many positions for canon characters are open and available. Crossover and otaku characters are accepted. The role-players are allowed to create and role-play their own story lines. Several member-created story lines are already active and currently accepting new role-players. Please note: You must be a registered member of the Galaxy Cauldron Forums to view the RPG. Welcome to the GC Role-Playing Boards! Anyway, I love it there. ♥ Join us!